New Hope Canoe Club practices pretty much year round. We have the seasons broken down to pre-season, regatta, long distance and post season. PRE-SEASON-(PS) Practice runs January-February. The PS racing season is March-May. Dues are $25 per month plus race entry fees. REGATTA SEASON- (RS) Practice runs March-July. RS begins in June and ends in early August with the State Championships. RS dues are $200 and includes all regatta race fees and club shirt. LONG DISTANCE- (LS) Practice and races begin in mid August and run through early October, ending with the Molokai channel races. Dues at $50 for club paddlers and $100 for others plus race fees and expenses. POST SEASON- Begins after long distance ends from October-December. Practice days may be less frequent and NHCC usually takes a break during the holidays in December. 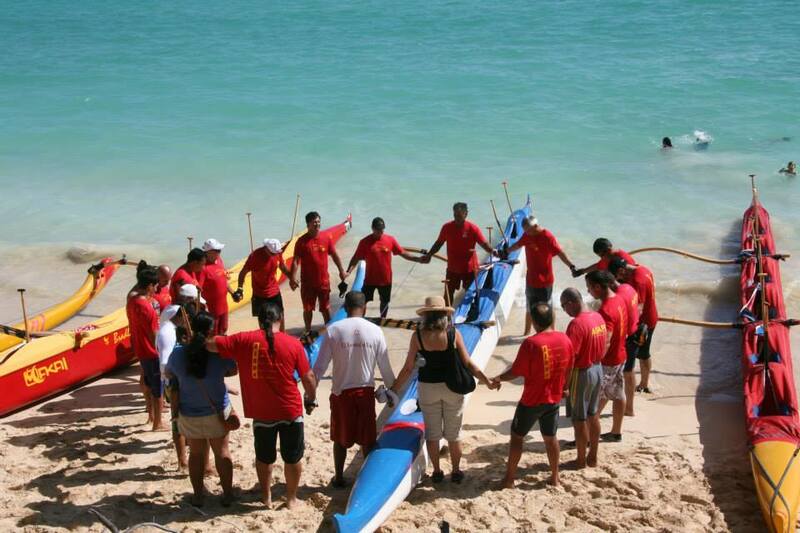 Dues for this season are $25 per month as they are in pre-season.Competitive paddling practice is held at our Sand Island site every Tuesday and Thursday from 5:00p-6:30pm and Saturdays at 7:00am. warm to put on after practice. It is also handy to have energy bars/gels. Optional: paddling gloves and cap. Continue onto Sand Island Parkway. Our canoes will be on the left behind the bathrooms. Parking is available in the dirt parking lot or marked stalls. PLEASE READ PARKING SIGNS BEFORE LEAVING YOUR VEHICLE.